To begin with I highly recommend this book of technical information and procedures for anyone wanting to learn wax modeling techniques (as always given patience and practice in carrying out the exercises). There is very little available in English on jewellery oriented professional wax working and this text contributes to the field. A good half of the currently available books are by Japanese authors (Wada for instance). This is interesting when one considers that Japan did not have a tradition of precious metals jewellery using gems until after the Americans (and later DeBeers) introduced the concepts after World War II. Overall this book is clear and well organized. Good large step by step explanatory black and white photos (some of which are a bit on the gray side) illustrate the points made in the concise, strictly informational text. This is the second in a series of books on professional wax working for lost wax casting. It might be useful to have read the first volume (‘Basic Wax Modelling’, printed in 1985) before this 1993 volume but it is still a good stand-alone text. My immediate response to this one was to obtain the first volume too. Originally written in Japanese by Hiroshi Tsuyuki and Yoko Ohba it is translated extremely well by Susumu Satow. Several color plates of finished work preface the table of contents and demonstrate the relationship of the wax working shown to the final work. It was part of the course curriculum for lost wax courses at the Japan Jewelry Craft School. 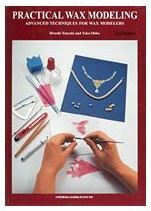 Chapter subjects include hard wax modeling techniques, soft modelling, incorporating gemstones and finishing castings. The sections are organized into specific projects, each teaching a different and cumulative set of information. Examples of specific skills addressed include numerous texturing methods, hollow construction, carving, hot working options, shaping sheet wax over forms, wire work, simple setting construction, sizings and the use of Japanese tools and materials new to North American professionals. Each project begins with a worksheet page briefly describing it, important considerations and a list of materials and tools required. The design sense is subtly Japanese with some projects feeling fairly ‘cute’ by North American Standards. This does not detract from the information given. Along with flexible shaft bur use there is also some emphasis on scraper work (where a North American might quickly reach for a flex shaft). The use of hand scrapers does promote better control and understanding for someone learning the techniques-but a professional constrained by time and money might adapt some procedures shown to more machine tool use. The occasional hint of the Japanese sense of poetry and observation flavors the text. Several techniques new to the West are introduced. The Japanese kisage scraper and wooden tools for modelling are examples as is mitsuro, a intriguing blend of yellow impression wax, soft wax and pine resin which has historical importance in Japan and produces a fibrous, lined, cloth-like material when stretched out in the fingers-quite unique and offering an addition to the vocabulary of the professional wax worker. The utilization of the nature of materials to produce an element to be used in the design of a piece is a particularly Japanese sensibility and a welcome one for us who so often merely force form onto the material we work with. The book has a sturdy spiral binding which allows one to easily lay it flat for reference while doing the projects. The use of spiral bindings for goldsmithing books demands homage to Harold O’Connor’s 1970’s Jewellers bench reference book and Tim McCreights use of the same for his popular series of books. The translation feels like that of a native English speaker with some experience with goldsmiths jargon. Flaws are extremely few: ‘router’ instead of the jewellers jargon word ‘bur’, ‘cleaner’ for ‘ultrasonic cleaner’, ‘rout’ for the verb ‘to bur’, otherwise a very good job. There are almost no typos , the rare words run together; a dashed line instead of what I presume is the word ‘soldered’ at the end of the book in my copy-fixed in future ones. There are a few odd technical approaches such as obtaining a mat surface and depletion gilding by coating with a borax solution before heating and pickling-in fact you don’t need to use any borax for this. A short appendix of measurements and conversions emphasizing American ring sizes and inches finishes off the book. The book is what it claims to be-a documentation of a curriculum which teaches wax working techniques. Fixed, rather conservative designs and clearly described projects give information. For a North American the Japanese part of it-the mitsuro, the scraper types are intriguing and for collectors of technical information an added reason to pick this one up.